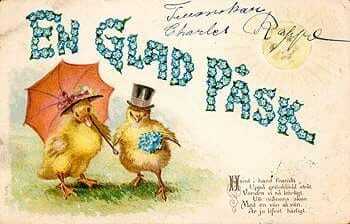 This weekend is the Easter weekend in Sweden and in many other places! Swedish people start celebrating already on Thursday. We call it Pink Thursday, but it actually means Pure Thursday. It’s a time to feel pure and happy. It’s also the day when all the witches come out and ask for candy. Well, the children get dressed up as witches and ask people in their neighborhood for candy. And then we eat a lot of eggs and paint the egg shells and use for decorations. Happy Easter!